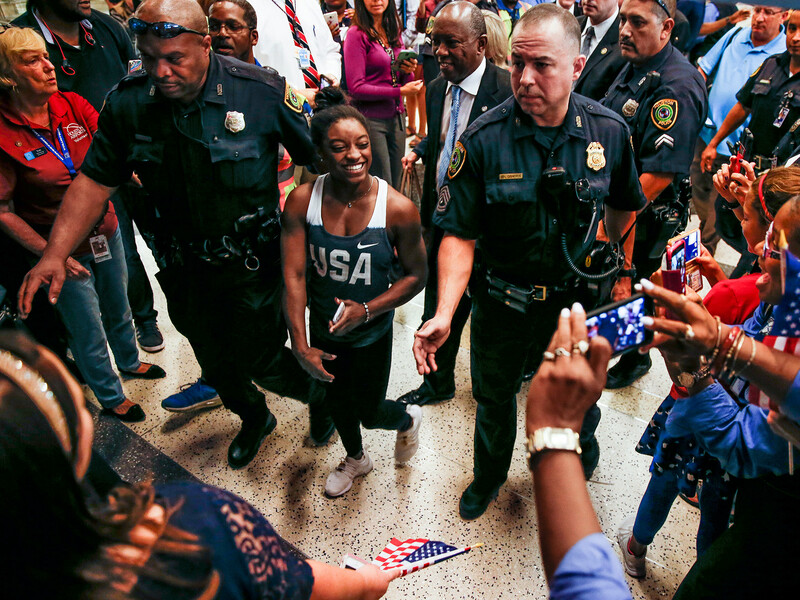 There hasn’t been much normalcy for Simone Biles since returning from Rio, but the 19-year-old is learning to take the screaming crowds and her whirlwind existence in stride. Everything seemed normal after Biles first brought her five Olympic medals through customs in New York. Friends had told her, “America is going crazy over you guys,” but the Final Five’s reaction was, Whatever, it isn’t true, and they smoothly deplaned before leaving for their first post-Rio stop: the Empire State Building. There, the quintet was escorted to the exclusive 103rd floor. From that height, even the tourists on the general observation deck 17 floors below become microscopic. It was a serene moment—a chance to breath. But the trip also included time with a swarm of reporters who had the gymnasts up against the railing once they emerged in the public area. Another flock of paparazzi waited on the street. An autograph signing was planned at her family’s gym (which has seen enrollment nearly double over the last month), but then calls started coming in from Mexico and Canada asking about restrictions regarding camping out for the two-hour event. Gym manager Adam Biles, Simone’s brother, had to cancel the whole thing. She still thought she’d be able to go to the Apple Store and get a new phone, but she eventually required mall security’s help to get out in time for a doctor’s appointment. Of course, Biles has done her fair share of freaking out as well. In Rio, she hid her face when Zac Efron walked into the room and nearly fell over after he kissed her on the cheek. When she was blessed with the honorific “My Houston Girl” by Beyonce at the MTV Video Music Awards? “I thought I was going to die, oh my gosh,” she says. Biles has gotten a selfie with Kim Kardashian and hugged Channing Tatum on Ellen, too. Still, she treasured her time with teammates atop the Empire State Building as much as any of those run-ins, given it was a rare moment alone with them since they first paraded into the Rio Olympic Arena for team all-around qualifications. She was ready to regain a bit of normalcy last week when she traveled to Colorado to train for the Tour of Gymnastics Champions, which begins Thursday. After that ends in November, Biles is hoping for a real vacation. Her last two weeks, traveling from New York to Houston to New York to Los Angeles to Houston to Colorado, hardly count. Simone Biles competes during the floor exercise of the Women's Gymnastics Qualification on Aug. 7, 2016 at the Rio Olympic Arena in Rio de Janeiro, Brazil. Simone Biles competes on the balance beam during the Women's Gymnastics Qualification on Aug. 7, 2016 at the Rio Olympic Arena in Rio de Janeiro, Brazil. Simone Biles competes on the uneven bars during the Women's Gymnastics Qualification on Aug. 7, 2016 at the Rio Olympic Arena in Rio de Janeiro, Brazil. Simone Biles competes on the vault during the Women's Gymnastics Qualification on Aug. 7, 2016 at the Rio Olympic Arena in Rio de Janeiro, Brazil. Simone Biles competes on the balance beam during the Women's Team All-Around Final on Aug. 9, 2016 at the Rio Olympic Arena in Rio de Janeiro, Brazil. Simone Biles smiles during the Women's Team All-Around Final on Aug. 9, 2016 at the Rio Olympic Arena in Rio de Janeiro, Brazil. Simone Biles competes on the uneven bars during the Women's Team All-Around Final on Aug. 9, 2016 at the Rio Olympic Arena in Rio de Janeiro, Brazil. Simone Biles, Gabby Douglas and Madison Kocian wave in celebration after the Women's Team All-Around Final on Aug. 9, 2016 at the Rio Olympic Arena in Rio de Janeiro, Brazil. Team USA's Aly Raisman, Madison Kocian, Laurie Hernandez, Gabby Douglas and Simone Biles wave during the presentation ceremony after the Women's Team All-Around Final on Aug. 9, 2016 at the Rio Olympic Arena in Rio de Janeiro, Brazil. Team USA's Aly Raisman, Madison Kocian, Laurie Hernandez, Simone Biles and Gabby Douglas bite their gold medals during the presentation ceremony after the Women's Team All-Around Final on Aug. 9, 2016 at the Rio Olympic Arena in Rio de Janeiro, Brazil. Simone Biles competes in the vault during the Women's Individual All-Around Final on Aug. 11, 2016 at the Rio Olympic Arena in Rio de Janeiro, Brazil. Simone Biles competes in the uneven bars during the Women's Individual All-Around Final on Aug. 11, 2016 at the Rio Olympic Arena in Rio de Janeiro, Brazil. Simone Biles competes in the balance beam during the Women's Individual All-Around Final on Aug. 11, 2016 at the Rio Olympic Arena in Rio de Janeiro, Brazil. Simone Biles competes in the floor exercise during the Women's Individual All-Around Final on Aug. 11, 2016 at the Rio Olympic Arena in Rio de Janeiro, Brazil. Simone Biles poses with three of her gold medals during a photo shoot on Aug. 14, 2016 at the Main Press Centre in Barra Olympic Park in Rio de Janeiro, Brazil. Simone Biles poses with swimmers Katie Ledecky and Michael Phelps during a photo shoot on Aug. 14, 2016 at the Main Press Centre in Barra Olympic Park in Rio de Janeiro, Brazil. Simone Biles competes during the Women's Balance Beam Final on Aug. 15, 2016 at the Rio Olympic Arena in Rio de Janeiro, Brazil. Simone Biles competes during the Women's Floor Exercise Final on Aug. 16, 2016 at the Rio Olympic Arena in Rio de Janeiro, Brazil. Simone Biles receives a gold medal after competing in the Women's Floor Exercise Final on Aug. 16, 2016 at the Rio Olympic Arena in Rio de Janeiro, Brazil. It’s ironic to think having four medals placed around your neck might take a weight off your shoulders, and it’s not quite accurate, either. Not for Biles at least. She’s spent much of her post-Rio time living out of a suitcase. Her visit to church last Sunday was extended 45 minutes when her fellow parishioners surrounded her. The priest ultimately got involved. She consciously tries to enjoy each moment in the whirlwind that's followed her historic performance in Rio, but doing so is not always easy. It was particularly tough Tuesday when a hack of the World Anti-Doping Agency revealed aspects of her confidential medical file. By the time Biles went to the VMAs two weeks ago, she was beginning to understand her new reality. When she slipped going down the stairs in heels that night, she knew immediately that someone must have been recording her and that the video would eventually blow up online. It did. She retweeted it. Then she took the next question.